Foodista | Playing With Your Food - 3 Healthy Snacks Moms and Kids Will Love! All of these snacks are both super healthy and a great way for you and your kids to get your 3 A Day in a fun way! All of these snacks are super simple, and perfect for both after school noshing or easy entertaining (zoo themed birthday party, anyone?!) and they're all naturally gluten free and allergy friendly. (Personally, I think it looks like a squid but that's just me.) This deep sea creature makes eating your 3 A Day of fruits super fun and easy! Use the other half of the banana in a smoothie, on a sandwich (or fried peanut butter 'nana sammich, anyone? Thank you, thank you very much.) Dairy Free/Vegan. Make super cute (not to mention quick and easy!) penguins from black olives, cream cheese and carrots - wow! 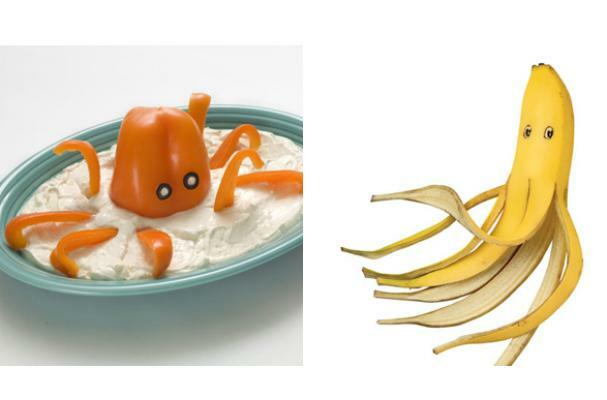 Cut a bell pepper to look like an octopus, add cream cheese and olive eyes and voila! Use the second pepper as dip strips in hummus, ranch or your favorite sauce. Dairy free/Vegan options.